Book: Bears! Bears Bears! by Bob Barner. This is a great book for vocabulary. Simple, rhyming text presents eight different kinds of bears that live all over the world. The kids were familiar with some - pandas and polar bears are very recognizable - but there were some new ones introduced, too! 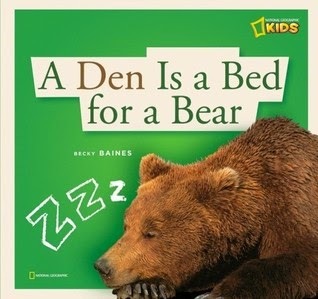 Book: A Den is a Bed for a Bear by Becky Baines. I like this nonfiction text for its photographs and simple rhyming text that explains the concept of hibernation and what bears do in their dens. This is another one that includes lots of great vocabulary. The trim size is a little small for group sharing and the extra facts on each page do make the spreads a bit cluttered for a readaloud. I look for books that include words that kids may not hear very often. Books can be a great source for kids to hear words that are not used much in normal conversation. Kids can't recognize these words when reading if they've never heard them before, so it's important to introduce kids to lots of words! The bear puppet then "falls asleep" and I ask the kids if they'd like to sing again and we wake up bear and start again! They really liked this song and one of my kiddos picked up the puppet and wanted to sing it with me again during our play time. Book: Where's My Teddy? by Jez Alborough. 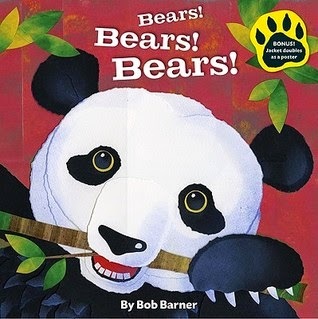 This is a favorite of mine because it's a very silly story with lots of rhyming words* and the book has a large trim size that makes it great for sharing with a group. *Hearing rhyming words help children hear that words are made up of smaller sounds, which helps them when they start to learn to read and sound out words. 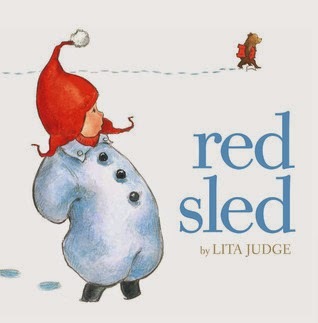 Book: The Red Sled by Lita Judge. This nearly-wordless book shows a bear and his friends borrowing a red sled and taking it for rides all over the forest before returning it in the morning, leaving only footprints for the little child to find. When I read this whimsical book, I read the sound effects words on the page and I ask the kids to help me tell what is happening. This is a fun story to share in winter since many kids will be able to relate to the experience of sledding. Felt Activity: Color Bears. I handed out the bears to the children and they brought their bear up to the board when I called their color. With this activity, we practice listening and following directions. We also reinforce color concepts and we practice counting when we count them all up at the end. I set out wooden blocks and color sorting bears similar to these by Lakeshore Learning. It was amazing to me how long the blocks kept the kids occupied! I also had a table set up with simple folded typing paper and die-cut bears in red, pink, and purple so kids could make Valentines ("(I love you BEARY much!"). I don't always do a craft, but this was very simple and easy to put together, plus an activity like this encourages children to practice writing (or drawing or scribbling, etc. etc. ).